Today was a big day for the Wombats. It promised to be their biggest trip yet, a journey into the center of Manhattan. This would be their first trip to the Big Apple so we gathered them together and explained to them what was going to take place. Can you feel the excitement? They were so stoked to be going into the city for the day! It started out with an exciting jaunt to the doctor's office. I was extremely nervous about sitting with them in the tiny New York City waiting room. 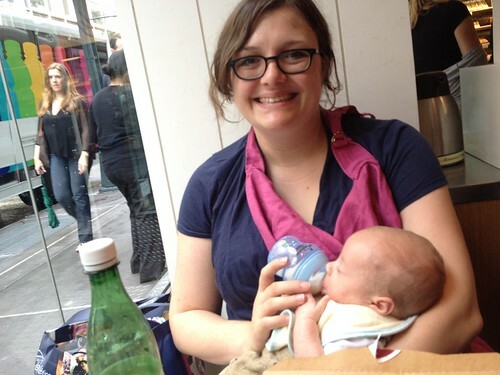 I was filled with a gnawing fear that the second Jen went in to her appointment they would lose their minds and I'd be stuck trying to soothe them surrounded by New Yorkers filled with hatred for me and my babies. Thankfully the appointment lasted approximately five minutes and we left the first stop unscathed. After the appointment we took them to Pret a Manger, possibly the loudest lunch spot in all of Manhattan. We fed ourselves with one hand while the boys ate their lunch and we got them satisfied for their stops by both mommy and daddy's offices to meet and greet their fans. 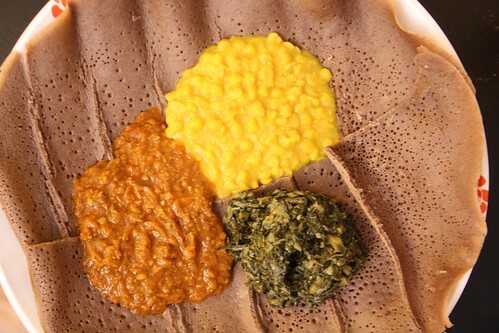 After this huge day, a trip to the grocery store, and the journey home we hadn't much time for dinner so we picked up this ready made Ethiopian food (Gomen, Kik, and Misir) which we served on top of Injera bread. I wish I could say I served it on a communal plate with no utensils for the authentic feel of it all but the real treat in all of this was only having to wash one dish! 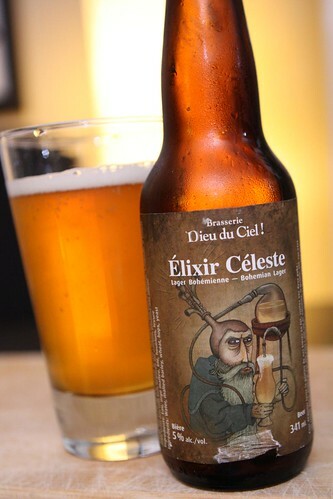 For beer I had another of Jen's dad's gifts, this Élixir Céleste from Brasserie Dieu du Ciel! Readers will note that I generally do not enjoy lagers but this one was quite good. Most any lager would be a good accompaniment to spicy food but this one seemed to have a good amount of flavor and character even on its own. Overall this was our most ambitious day yet. The guys behaved like true gentlemen. Even the pedestrians of New York City often stopped to admire the boys and chat with us, much to my dismay. It's like they've never seen movies and don't realize they have to walk around saying: "I'm walkin' here!" and "Fuggedaboutit!" 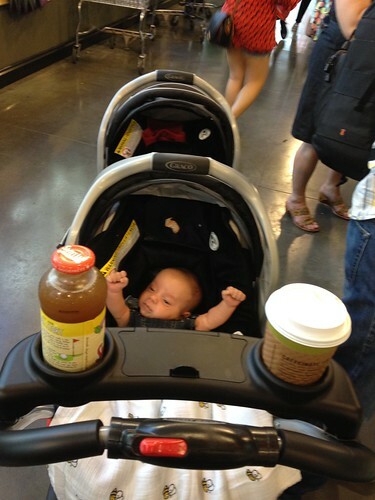 While it's a bit easier to get into Manhattan without twin babies and all their gear it was still quite a bit of fun to show them off to people and hear them be showered with praise. Hearing about how cute people think your babies are is pretty great. Especially when you pretend that you had something to do with it.